09: 2:30pm Titan Run Assembly! If your son or daughter is interested in Scouts, but you were unable to attend the September 20th join night, feel free to come to the cafeteria at 7 o’clock on Thursday, October 4. To all our previous and new Scouts please wear your Scout uniforms and attend your first den meetings at 7 o’clock! If you have any questions, please feel free to call or text Jacquelyn Delplanche at 503–547–3872. This is a lollipop dressed as a ghost! Students can purchase ghosts to be delivered to their friends throughout the school. Each ghost costs only 50 cents! An order form will be coming home with your child Wednesday, October 3. Drop off starts Monday, October 8th until Monday, October 22. Place your order and attached monies in the marked Ghost O Gram receptacle in front Lobby. Delivery will be on Halloween Day, October 31st. Our only fundraiser of the year- the Titan Run- is going strong! We have raised $26,829 towards our goal of $50,000! Let's keep going! Tuesday, October 2: 8:30am Money Jump Assembly- any student with a pledge gets their name in the running for a chance at jumping for money! Tuesday, October 9: 2:30pm Pie in the Face Assembly- any student with a pledge gets their name in the running for a chance to throw PIE at some of our favorite teachers! 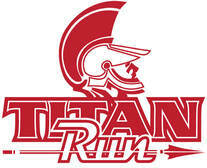 Parents are encouraged to come to our assemblies and the Titan Run. If you have any questions, please see the Titan Run website or contact Mrs. Sheridan. We will not be meeting this Thursday. Please join us November 14th for our next meeting. Each Saturday, our volleyball teams need a Site Monitor to keep the games running smoothly. Duties include: directing guests, reading the opening prayer, crowd control if needed and potential incident reporting. Sign up on School Speak!